After you’ve got the hang of performing Basic CRUD operations with cx_Oracle you’re ready to start tapping into some of the real power of the Oracle Database. Python is an excellent language for most things you want your application to do, but when you’re processing data it just goes faster if you do the work where the data is. Basic Oracle PL/SQL and SQL knowledge. If you’d like to follow along with the examples you’ll need to create the following objects in a database schema that is safe to experiment in. Make sure you have permissions to create the following objects. To clean up the database when you are finished with the series, you need to drop the two tables and the package. 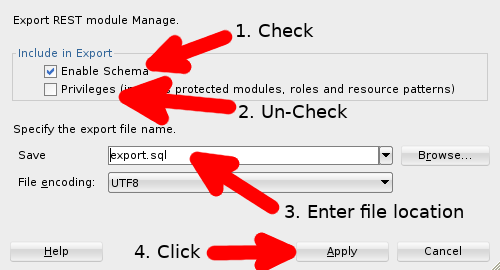 Please make sure you’re connected to the correct schema where you created the tables. I will include this code section with all Python examples and use the connection object “con” and the cursor object “cur” throughout the series. I’m going to start off with the most basic process and simply execute an anonymous block of PL/SQL code to reset the database tables. You can execute any DDL or DML statement like this, but if you’re going to run PL/SQL it’s usually best to compile it to the database. 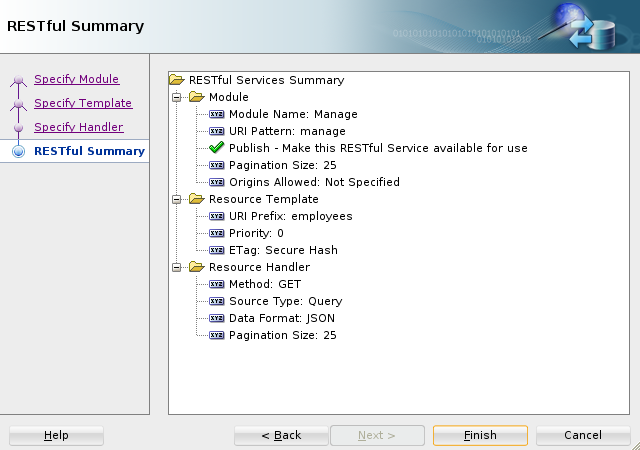 Using the code from the anonymous block I created a procedure in the PL/SQL package called reset_data. To call this procedure from Python we use the cursor.callproc method and pass in the package.procedure name to execute. Assuming everything works, there will not be any response. So this works as a ‘fire and forget’ way to call database procedures. 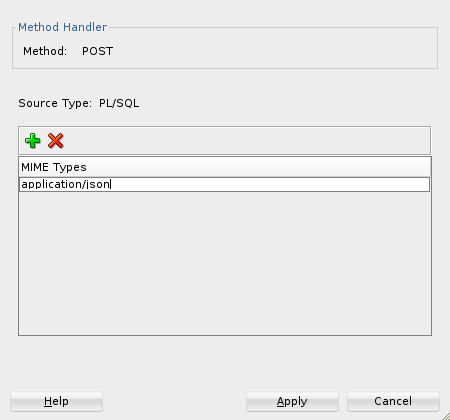 I have a procedure in my PL/SQL package that we can use to create a new pet in the lcs_pets table. It accepts the pet_name, owner_id and pet_type. Using these values it will insert a new entry into the lcs_pets table. Now on the Python side. I prefer to set my values with variables so that my code is easier to read, so I’ll create and set pet_name, owner_id and pet_type. Next, I’ll call the cursor.callproc method and add an array containing the values to pass in the order they are defined in the database. If everything works there will not be any response. You can also use keyword parameters. This also makes your code easy to read and also makes it so you don’t need to worry about the order of the parameters. Once again, if everything works there will not be any response. When a row is added to the lcs_pets table a new id is automatically generated. Having this id can be useful so I created a function in my PL/SQL package that will create a new pet in the lcs_pets table, just like in the previous function, but it will return the new id. Using Python to call a function in the database and get the return value I’ll use the cursor.callfunc method. I set the variables that I’ll use as arguments to the function. I pass in the array of values just like I did when I used callproc. Out parameters can be very handy when you need to pass back more than one piece of information. I have an add_pet function in the PL/SQL package that will check to see if the pet type you’re adding needs a license or not. 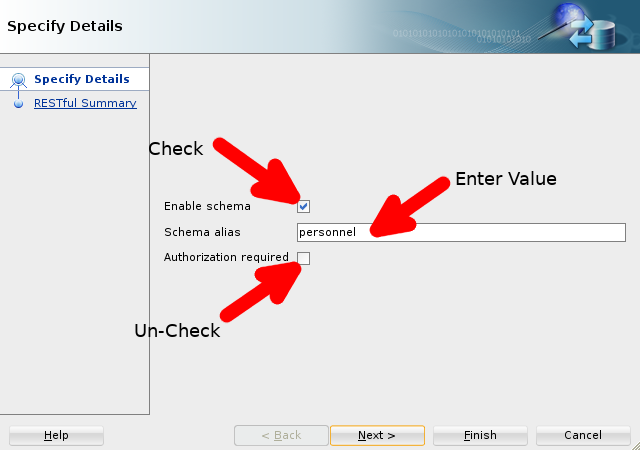 The function will return the new id like before, and a ‘yes’ or ‘no’ through the out parameter. To work with the out parameter in Python I’ll add a string variable called ‘need_license’. 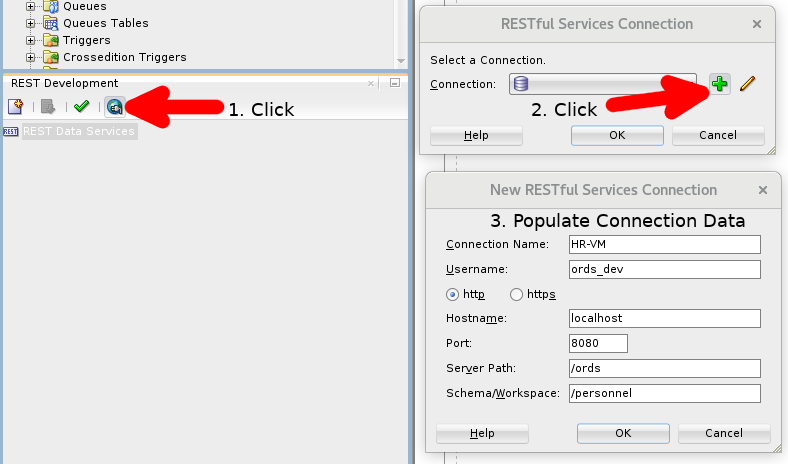 It can be defined using ‘cursor.var(str)‘. Then we just add the new variable to the values array in the correct position. This works the same when using out parameters with the callproc method. To get the value from ‘need_license’ we call it’s getvalue() function. So far I’ve hard-coded the variable values in the Python code and the methods are fairly simple, so there’s a low chance of errors. But, for most methods, we want to accept parameter values that can be passed into the Python code then on to the PL/SQL functions. I’ll modify the Python method to accept command line arguments. We need to import sys so that we can use sys.argv to grab the command line arguments and assign them to the variables. Now that I’m accepting outside argument values, the odds that I’ll eventually get errors with the above code is almost a certainty. If an error happens in the Python code you can handle it as you normally would. But, what if there’s an error thrown by the PL/SQL code? It’s easy enough to test this. Make the same call as before but pass in a string for the second value. I would recommend that you handle errors as close to where they happen as you can. 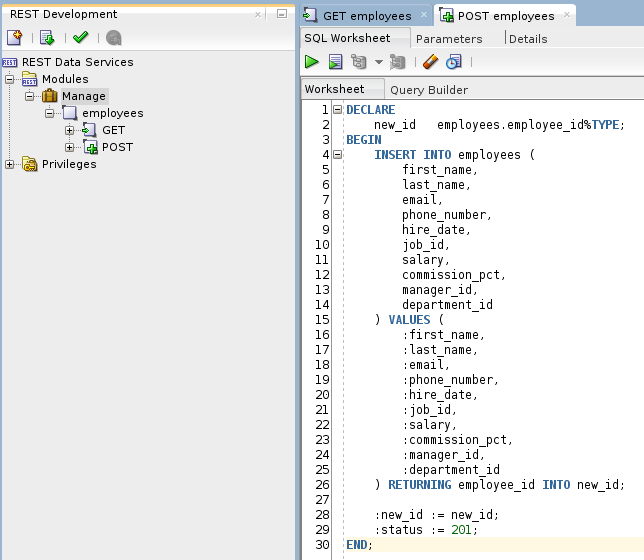 In this example, you could catch the error in the PL/SQL function and either handle it or raise it. If you don’t handle it in PL/SQL it will be passed back to cx_Oracle which will throw a cx_Oracle.DatabaseError. At that point, you can handle it as you would when any other Error is thrown in your Python application. Links will be added for each topic as that article is published. I will use the DinoDate application (source) as my code base. For this post, assume that I have DinoDate installed and all development to date has been done directly in the database (source code not stored externally in files). Since, however, it’s really not a good idea to edit and maintain code directly in the database, I’d like to switch to storing the DDL for my database schema objects in files, managed by a version control system. Let’s get going! I could export the code for my objects out into files by writing queries against built-in database views like ALL_SOURCE. I have used this method a few times, and you probably have, too. You can make it work, but it puts the onus on you to get everything right. I’d rather think about other things, so I ask myself: is there a tool that will take care of the heavy lifting on this step? 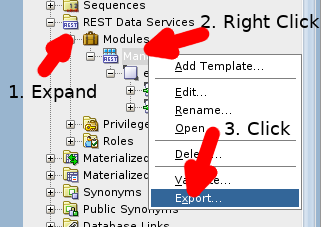 Under the Tools menu, click on Database Export. 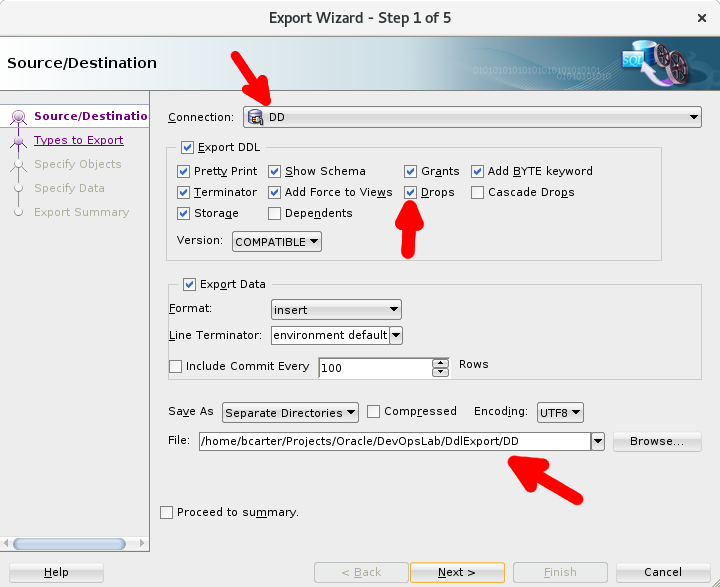 Choose the connection for the schema you want to export. 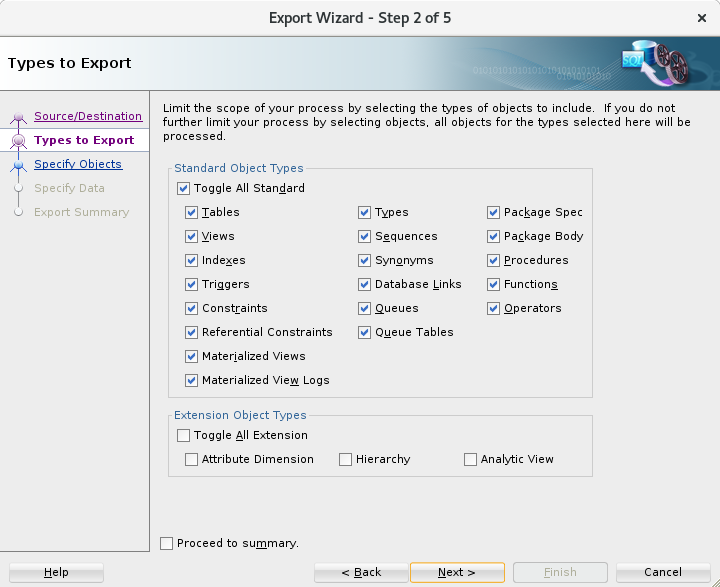 Select the options you’d like the wizard to use when creating the export scripts. I like to add drop statements to my scripts. You may also want to export grants. 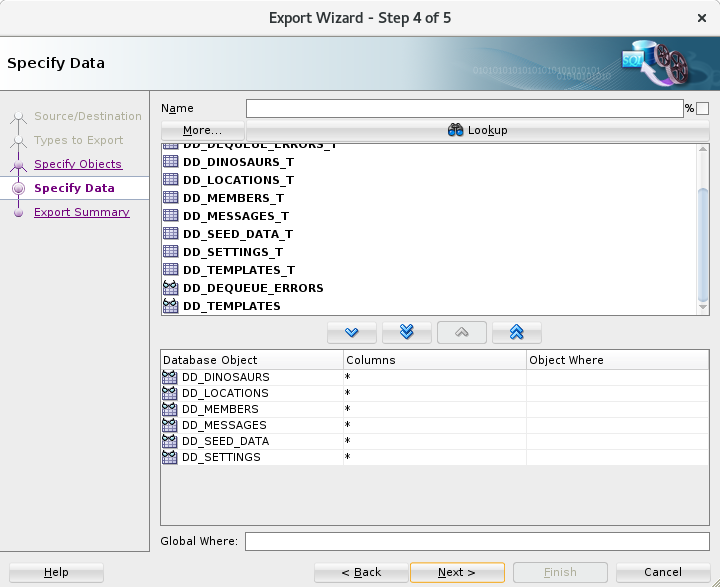 I want to export some of the master table data so I will leave the export data section set with defaults. 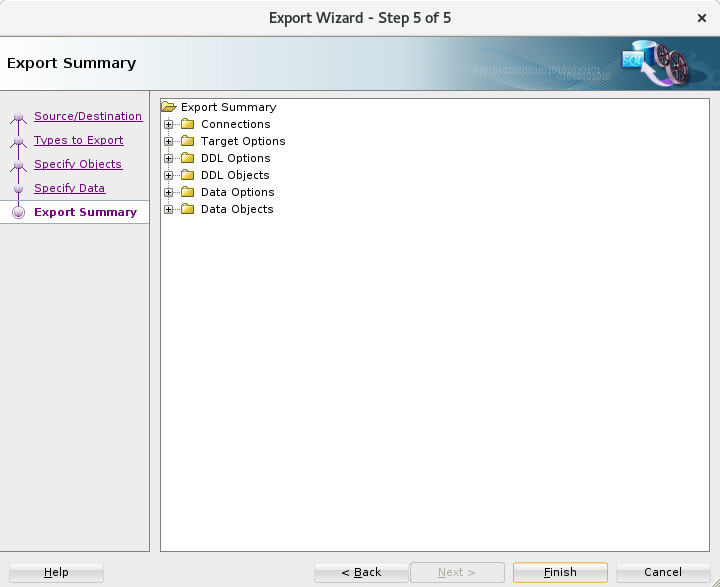 Choose “Save As Separate Directories” and select the export directory. 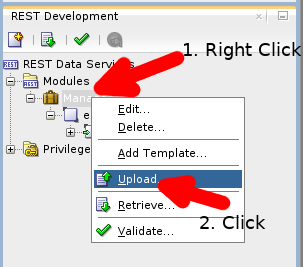 In step 2 I left all of the default options selected. 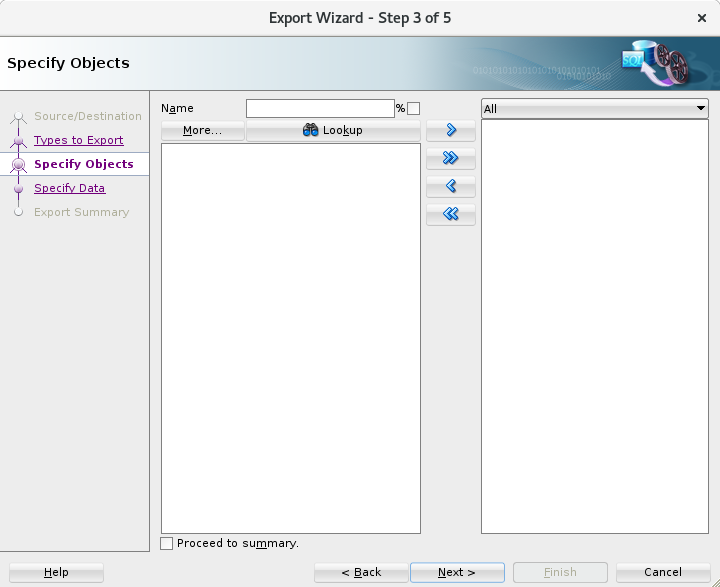 I want all of the schema objects so I skip step 3. 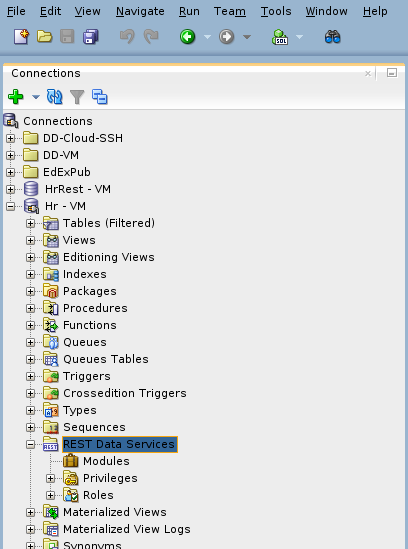 I selected the tables that contain the pre-loaded master data for the application. Everything looks good so click finish. Now that I have everything exported, I want to get the files into version control asap. I’ll be using Git for version control. 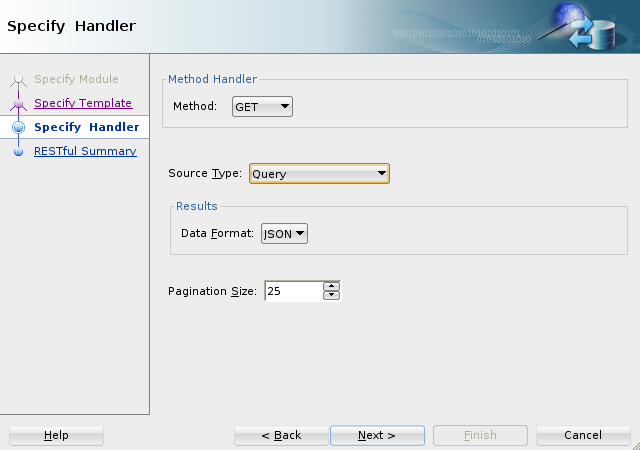 SQL Developer has some nice integrated tools for working with Git but for now, I’m just going to use the command line. Change to the export directory. Add all files to the repo. [DD]$ git commit -m "Initial Commit"
Assuming that you’re using a central Git repository, you should push the new repo up to the shared repo. That process can differ based on which repository host you’re using so I’ll leave it up to you to consult the documentation. Whenever you use any automated code generate/export tool, you should verify the results. After you verify each file, run a code beautifier on it. Maintaining a standard code format will make it easier to see the differences between changes. This will make your future code reviews much easier. Make sure you commit each file as you change it. Don’t wait till the end to do a massive commit. In another post, I’ll show you how to use a Schema Migration tool which makes managing schema changes much easier. My exported script was named Generated-20180706134514.sql. You will want to edit this file and modify the directory for the scripts to match the changes you made above. Also, you need to verify that the scripts are being run in the order of dependencies. Objects should be created after the objects they depend on. If you’re not planning to use a Schema Migration tool you’ll want to create separate master scripts for each of the create and update directories. Create a new schema that’s safe to test with, and run your master scripts. After you get the scripts running without errors, do a schema compare to check for any differences between your new schema and the schema you exported from. When it’s all the way you want it, you are now ready and able to work from files to build your database code. Pull the latest version of your code from the shared repository. NEVER ASSUME YOU ALREADY HAVE THE LATEST. Commit (to your source code repository, not your transaction) often. Push your changes back up to the shared repository. Of course, that is a very simplified workflow. You should start a discussion with your team about using more advanced methods to further automate and improve your processes. I sincerely hope you skimmed this post because you gave up long ago on editing code directly in the database. If that is not the case, I hope this article helps you make the change. Because then the next time something goes badly wrong, you can simply recover from Git (or your repository of choice). No tearing your hair out. No gnashing of teeth. No self-hating recriminations. Just a quick recovery and get back to work. And then you can move on to more interesting challenges in improving the way you write and maintain your database application code. In most ways, PL/SQL development is just like working with any other language but, sometimes it can be a little different. If you’d like to create a Continuous Deployment Pipeline for your PL/SQL application, here is a short list of tips to help you get started. Do not use the Database as your source code repository. If you are making changes to your application in a live database, stop right now and go read PL/SQL 101: Save your source code to files by Steven Feuerstein. There are a lot of version control applications out there, the most popular right now is probably Git. One advantage of using Git is, you work in your own local copy of the repository making frequent commits that only you see. 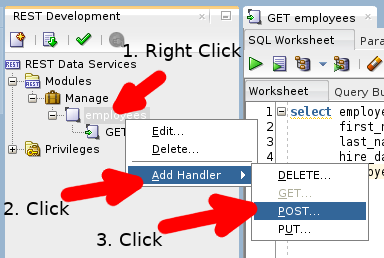 If you’re working in your own personal database you could compile your changes to the database at this point. If you’re working in a database shared with other people and you’re ready to compile your code, git pull from the central repository to get any changes since your last pull. Handle any merge conflicts, then git push your changes back up to the shared repository. After the push, you can compile your code to the database. This helps ensure that people don’t overwrite each other’s changes. Making frequent small commits will help keep everything running smoothly. What about your schema objects? Your schema objects, such as tables and views, are as much a part of your application as any other component and changes to these objects should be version controlled as well. The process of keeping track of schema changes is called Schema Migration and there are open source tools you can use such as Flyway and Liquibase. 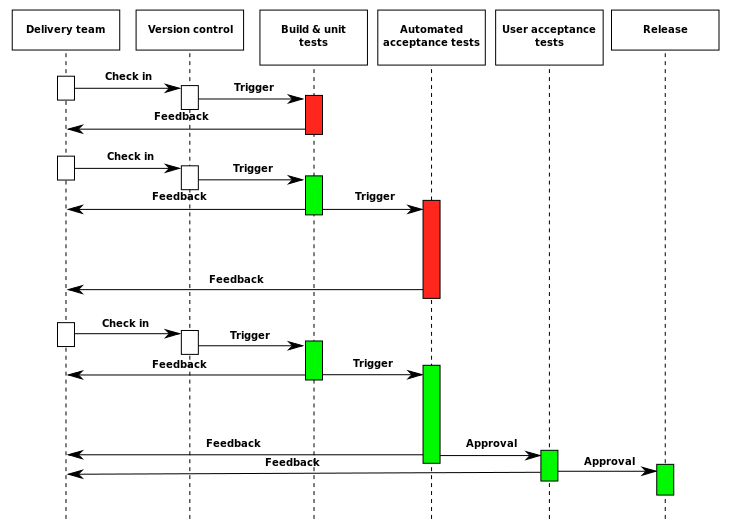 In any application it’s smart to have good test coverage, If your goal is Continuous Deployment it’s critical. A Unit Test is when you test a single unit of code, in PL/SQL that may be a function or procedure. 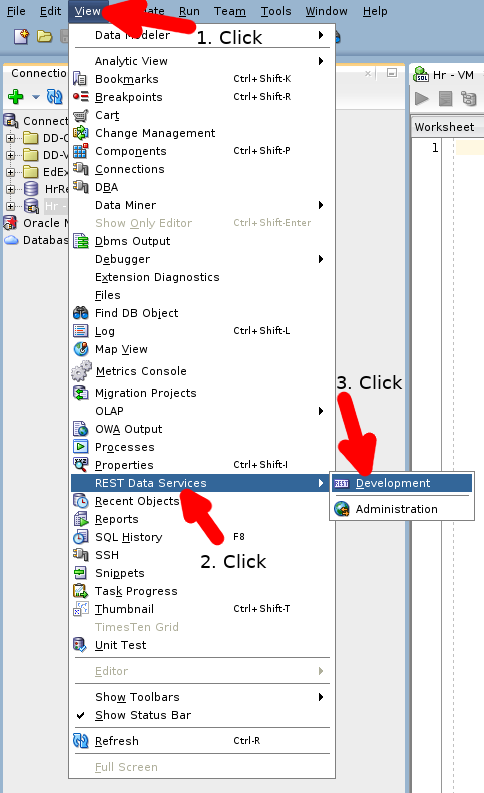 Setup the environment to simulate how it will be when the application is deployed. This might include changing configuration settings and loading test data. Clean up the environment, resetting it to the state it was in before running the tests. 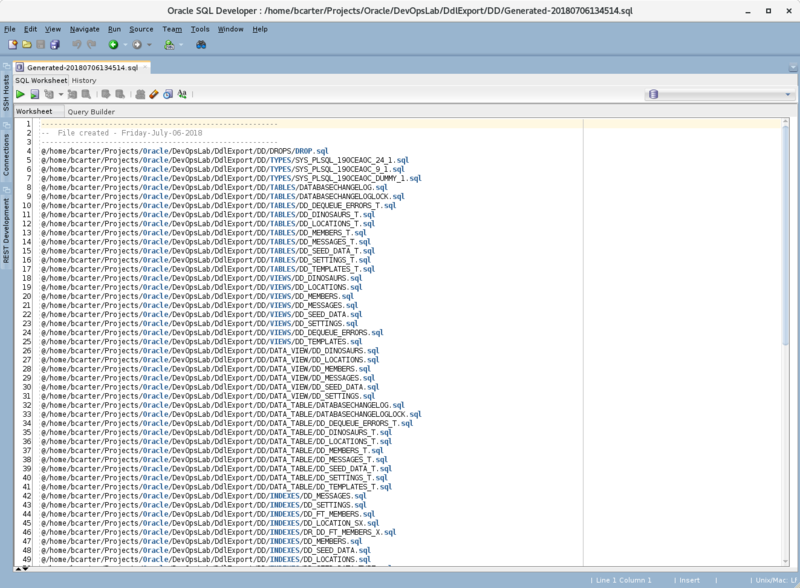 utPLSQL is a great tool for unit testing your PL/SQL applications. You will write a package of tests for each ‘unit’ of your application which should test all of the required functionality and potential errors. utPLSQL is an active open source project with an impressive set of features. Check out the docs to get started. 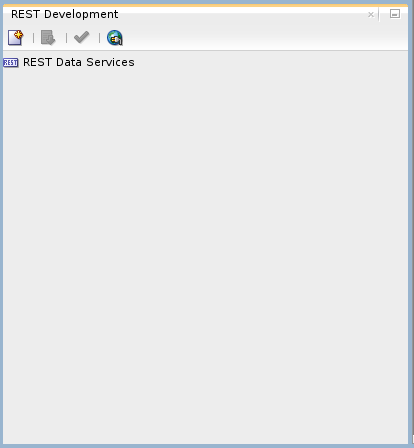 Building a database application usually consists of running the change scripts in a specific order. It’s common to create a master script that executes the others in order of how the objects depend on each other. However, if the master script simply executes the other scripts, you will need to create additional scripts to track and verify changes, and more scripts to give you the ability to rollback the changes if/when there’s a problem. There are build tools such as Gradle and Maven that can easily execute your scripts. But you’ll still need to create the additional control scripts. If you use a Schema Migration tool it should include a lot of these additional functions without having to write extra scripts. 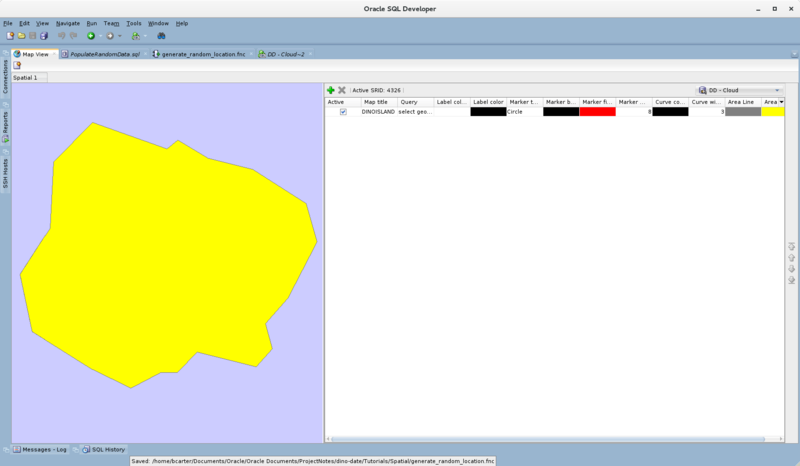 For an example, check out Dino Date which has a Liquibase migration included. 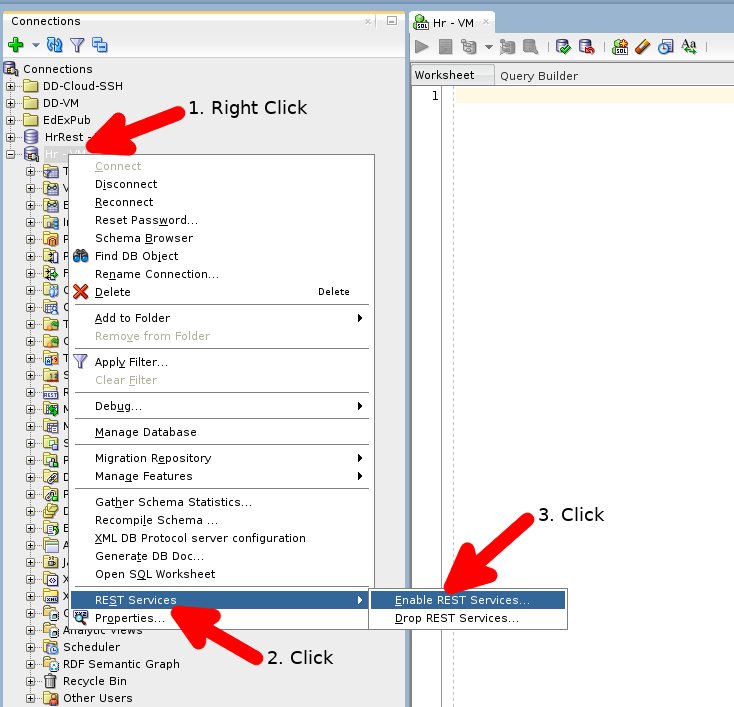 You could include your PL/SQL code in a Schema Migration changeset but adding schema migration notation to your PL/SQL introduces another layer of complexity and potential errors. In the Dino Date runOnChange directory, you will find examples of setting up Liquibase changesets that watch for changes in the files of objects that you would rather keep ‘pure’. 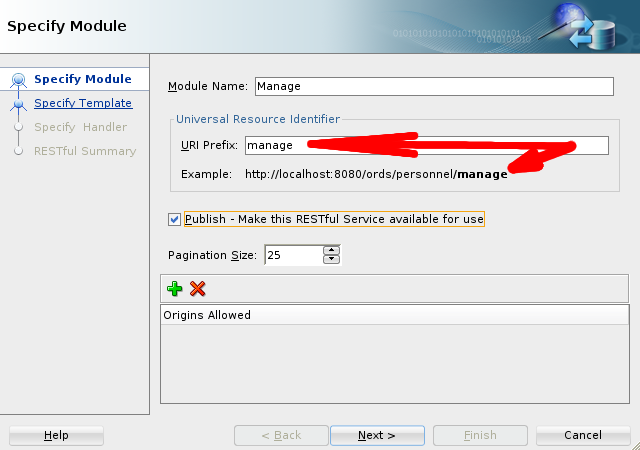 When you run a migration, if the file has changed Liquibase will run the new version. In a shared database environment, you should execute a schema migration after you pull/merge/push your changes into your version control system. All of these pieces can be tied together and automated with an automation server such as Hudson or Jenkins (both are open source) to create a build pipeline. Developer makes a change and pushes it to the shared Git repository. Hudson notices the repository has changed and triggers the build pipeline. The project is pulled from Git. 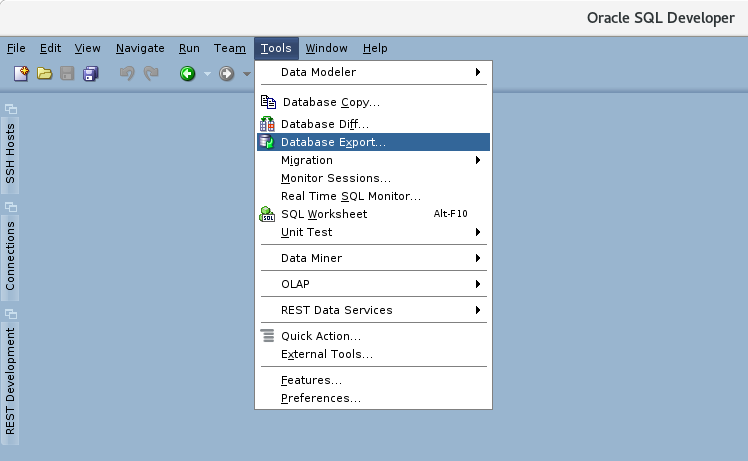 Liquibase deploys the changes to a test database. utPLSQL is trigged to run the unit tests. 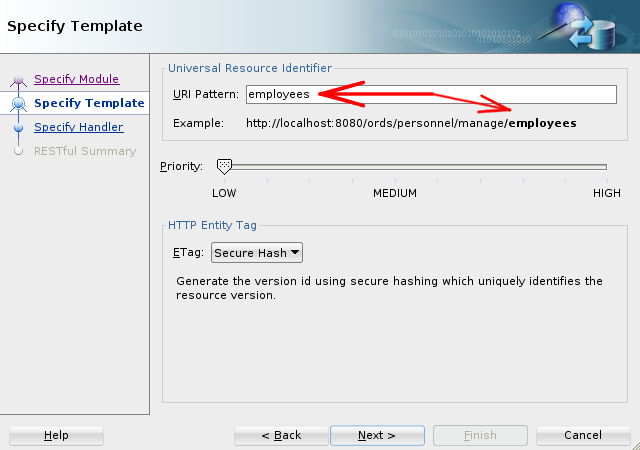 Liquibase deploys the changes to the production database. Edition Based Redefinition[pdf] can be used to deploy applications with little to no downtime. Oracle Developer Cloud Service comes with a ton of pre-configured tools to help with almost every aspect of your development process. Gitora can help you version control your application if you are not able to move out to files. 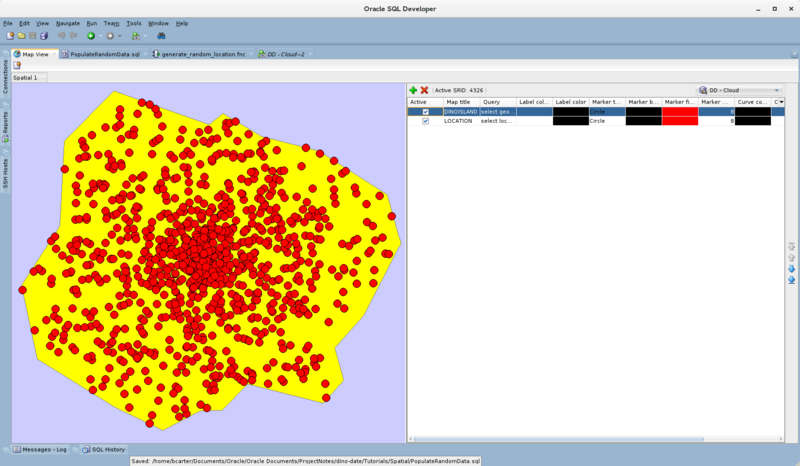 Lately, I’ve been digging into Oracle Spatial. It’s a lot of fun, but wow, there’s a lot to learn. I’m working on a series of tutorials that will walk through the process of building an island for our DinoDate dinosaurs to live on. 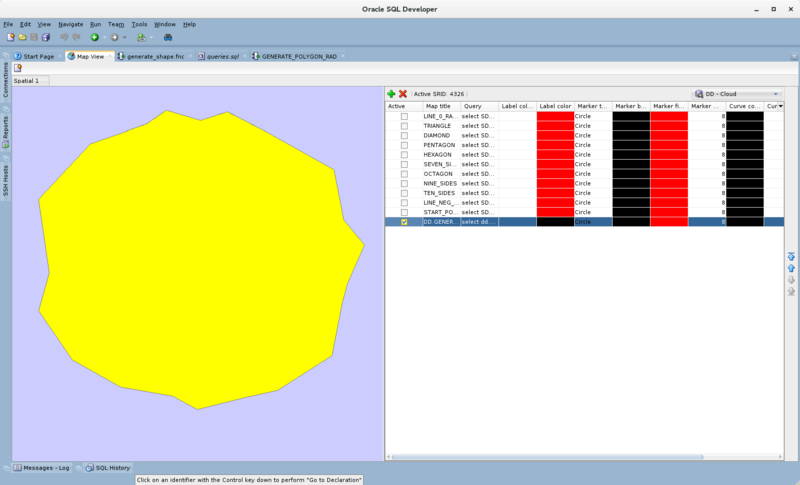 But in the meantime, I thought we could have some fun and look at a function to generate simple shapes. For a detailed explanation of the SDO_GEOMETRY object, you can check out the docs, or watch for my upcoming tutorial. In this post, I’ll just add brief comments to explain the parameters. I realize the code formatting isn’t the best on this post, so I’ve created a gist with the finished function. Our function accepts a latitude and longitude we’ll use to position our shape, the number of sides, a radius and a starting radian. Accepting the defaults gives us a 1 sided object with a 0 radius, sounds like a point to me. In fact, let’s make anything with a radius of 0 a point. Start with the given point at p_lon / p_lat. Go a distance of p_radius in meters. In a direction of p_start_radian. Get the lat / lon position of the new point. If you’re like me and it’s been so long since you took a trig class that you’re a bit fuzzy on what a radian is here’s an excellent definition. The example in that post shows a 0 radian starting in the 3 o’clock position and moving counter clockwise. use a 0 radian at the 12 o’clock position and move clockwise. The function we’re using to generate corner points is sdo_util.point_at_bearing. It considers 0 radians to be at the 12 o’clock position and moves clockwise. Once we have the new point, we’ll get the x / y coordinates of the point using sdo_util.getvertices and we’ll add those values to an sdo_ordinate_array. The sdo_ordinate_array defines the corner point for our shapes (or end points for a line) and the sdo_elem_info_array acts as a key used to define how we use those coordinates. Once again, if you want to dig into the details look at the docs, but here I’ll add short definitions. Let’s add some new variables to work with. each itteration will add a point at a distance of p_radius from the center point on the current radian. A 1 sided object with a radius > 0 could be a line or a circle. I’ve chosen to use an SRID of 4326 which is a lat/lon earth based system and is not a geodetic coordinate system, so circles are a bit more complex than I want to cover in this post. So, a line it is and we’ll include 2 sided objects as lines also just to keep it simple. I know, I used a bunch of fancy words and didn’t explain them. I’m trying to keep this post simple, but if you’d like to dig into all of the details, take a look at the docs.